These Fine Art Composition are on sale for 5 days only. Don't miss these fantastic savings. CLICK ON THE HIGHLIGHTED LINKS BELOW or the - CHECK HERE FOR MORE INFORMATION button if that is available to learn more. - GREAT WHITE EGRET WITH PLUMAGE. In this particular composition, “Wind Chimes through the Window,” it was the chimes blowing in the wind that ignited the initial spark, which stopped me dead in my tracks and captured my full attention. The colors of the bright orange, paper like flowers, the soft breeze and the warmth of the afternoon sun were all speaking to me. It was a culmination of these beautiful elements that drew me in. All and all it was a simply magical experience that seemed to sweep me off my feet. In fact I woke up the next morning still hearing those beautiful chimes, feeling the gentle breeze and the warmth of the afternoon sun. I love to take the time and listen to the silent communication with the bunnies in my backyard. I love to watch the chipmunks scurrying about darting to and fro, jumping over each and belly flopping, like their high on life and having a blast. When I have stumbled upon a magical moment that has captured my full attention, it's like a form of spiritual meditation. Whether I am composing a photographic composition or am writing in a stream of consciousness. Although, I am completely mindful of all that surrounds me, My body enters a state of Flo allowing my spirit to connect directly to the experience. From that point on my entire experience moves through me and is outwardly expressed through stream of consciousness thoughts, writing or through the creation of vision that is captured through my lens. All and all it was another simply magical experience that swept me off my feet and completely immersed me into that state of Flo. Based on the comments that I have received on this composition. I seemed to have captured, the exact vision and feelings that I had experienced in that particular moment in time. Note: All rights reserved. © 1998-2019 Mary Lou Chmura; No part of this publication may be reproduced, distributed, or transmitted in any form without the prior written permission of the author. My vision for this blog is to create a 'Magically Inviting', safe space that will inspire creativity; ignite a quest for exploration of your innermost thoughts, feelings and deepest passions. 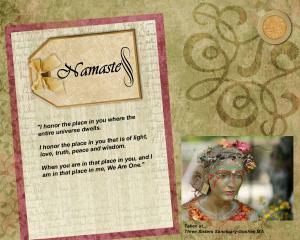 A place that honors you; where the freedom to be you is accepted with universal oneness, heartfelt connections and support. Upon viewing a fine art composition, a feeling or a deep sense of connection may surface. I encourage you to, "Feel, Explore and Artistically Express," through a creative outlet such as; writing, photography, drawing, etc. ; whatever feels most natural to you . Upon reading this blog you may find yourself identifying with something that has been written and be blessed with validation. Or you may find that you have been emotionally triggered. Once again, I encourage you to explore what lies beneath the surface. You may be energized by a thought provoking idea which may get your creative juices flowing. Or you may simply be touched by an inspirational quote. Feel, Explore and Artistically Express! This is your space to indulge yourself however you wish. "May each and every one of you feel the warmth, acceptance and unconditional love that this space has to offer." My 'spiritually inspired' compositions and writing are an outward expression, which I describe, overall, as....“Pieces of Me." I will write about my emotional connection and the compelling forces that lie behind many of my fine art compositions. Through my writing I will share many of my own life experiences. I hope to connect with my audience on a deeper, spiritual level. My belief is that we are all one with the universe; like our mind, body and spirit we share a fashionably intertwined connection. My hope is that, in return, you will be inspired enough to create your own space of exploration through artistic expression, whether through blogging, photography, scrap booking, painting,etc. titled....“Pieces of You." Hugs, Healing and Happy Creating! My vision and heartfelt wishes for mlcfineartphotography.com is to create an atmosphere of self exploration and creativity. Through the sharing of my artistic creations, visions and writings, I hope to inspire others to look within. Tapping into their private world where they may connect and explore their own inner landscape, ie; innermost, thoughts, desires, passions. Hopefully creating a spark that ignites a flow of creative artistic expression. Whether it is through, photography, writing poetry, drawing, mixed media etc. and last but not least Enjoy the Process!
" A 'Magically Inviting', safe space, that will inspire you to explore your innermost thoughts and deepest passions. Although, I am not a rule follower by any means and am more spontaneous by nature. When it comes to creating a vision and giving voice to my artistic creations, I have learned that when I am mindfully aware and in the present moment; my senses and feelings are engaged, bringing life and energy through me and into my creative process. Being mindfully aware of whatever draws me in; whether I am chasing the light, capturing a feeling or experiencing an emotional reaction; I call this the spark, the spark that ignites a force within; a source of energy and inspiration that starts the flow of the creation process. It could be as simple as a gentle breeze at my back, a glimpse of color out of the corner of my eye; a raindrop, a teardrop, a flower opening to the morning sun or a bird singing nearby. Whatever it is that captures my full attention, is then drawn into the creative process allowing me to create my vision with all my senses flowing. In other words, the more you are aware and attune to your senses; the greater the chance, your artistic expression will flow more naturally into your work. If feelings arise I allow myself to feel and explore them. Feeling my feelings during the creative process brings emotion through me and gives voice to my vision. Aside from creating Vision with voice, it is equally important to take the time and scope out the area, looking for the best vantage point to direct your lens etc. If you are near water you will want to look for the best angle to capture reflections. Although, these are just a few tips on creating with vision, there is much to be said about the entire process. EXAMPLE: I decided to use an example of creating vision and giving voice, using one of my artistic creations below. "The Magical Bond" fine art photography by Mary Lou Chmura can be viewed in my digital art collection. Awhile back, I had the opportunity to witness and photograph a mother giraffe bonding with her newborn calf. Through my viewfinder I watched as she deeply and passionately explored every inch of her new born calf's body. As I watched in awe, my body took on an intricate dance, all of it's own. An array of emotions and magical feelings, had re-surfaced and ignited from a chamber deep within my heart. 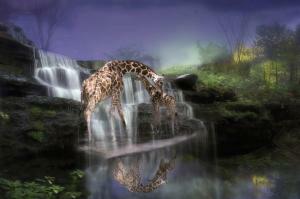 My vision behind this digital fine art composition, entitled, The Magical Bond was to not only bring to light the heartwarming love and affectionate gestures between the mother giraffe and her newborn. It was to artistically sculpt a scene that would reflect love, time, and beauty coming together in the stillness of the moment embodied with the alluring, magical, spark of vitality, that two souls share when they bond together. Like the vision above, I have written many summaries of my visions behind many of my fine art compositions. You may find these visions in the description section of my artwork. Being mindfully aware and fully open during the creative process allows me to give creative license to the collective parts of my experience in creating my vision. Many times, I write about the compelling forces that stopped me dead in my tracks; the magical invitations that crossed my path and captured my full attention. I may write about the sparks that were ignited, unleashing emotions that were brought to the surface. I may write about the source of inspiration. My hope is that you will be inspired, learn to appreciate the art of vision and gain a better understanding of the mindful nature, self exploration and creative license behind the making of each fine art composition. Be sure not to miss this introductory offer to my most recent Fine Art Composition, " In The Stillness Of The Morn." This Fine Art Composition is being offered at a reduced price for 5 days only. Don't miss this fantastic savings. Click on the highlighted link above for more information. In this Fine Art Composition, “In The Stillness Of The Morn,” it was the alluring stillness of the moment that captured my full attention. The dawns early light casting its harmonious glow on the weathered buildings with the still like reflections in the water below was the Universes's way of bringing synchronicity into to my being and igniting that spark to my creative vision. Exhaling and taking it all in, I knew I was home; from this point on I was in my beingness, connected to the stillness and the oneness of the Universe's rhythm of life. This familiar place of stillness has deep roots, within my being. It happens to be my favorite place to be. 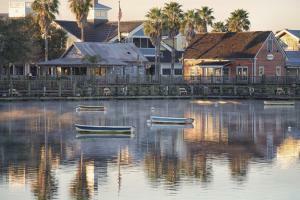 This fine art composition, “In The Stillness Of The Morn,” was taken at Lake Sumter Landing in The Villages, Florida. It was one of those moments where I felt deeply connected and in sync with the Universe's natural rhythm of life. 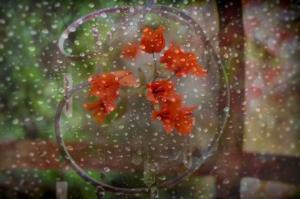 This Fine Art Photography Print will bring a sense of alluring stillness and grace to any room. .The special promotion being offered is for a 36 x 24 Canvas Art Print. Please Note: The fine art America watermark will not appear on your purchased print. All photographs and images: copyright ©1998-2019 Mary Lou Chmura – All Rights Reserved.